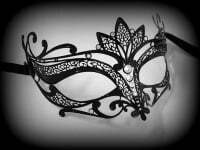 Deluxe edition butterfly shaped ladies Venetian Masquerade mask. 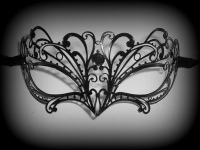 This elegant mask is made from black laser cut filigree metal and adorned with authentic Swarovski crystals. Designed to melt your heart, this stunning mask features delicate nero black laser cut metal and adorned with lots of beautiful genuine clear Sworovski Crystals that sparkle like little stars. 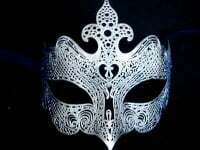 A truly impeccable touch to your party look, this graceful deluxe edition butterfly shaped ladies filigree mask is a real must-have for anyone wanting to exude glamour and true femininity. The gorgeous filigree design is stylish & versatile thus letting you show off your sense of style at your party. Lovely satin ties finish off the elegant Venetian look.